FEATURES: Ideal for soldering and all types RC connector. This jig quickly and securely clamps, holds, and releases these connectors for your soldering tasks. 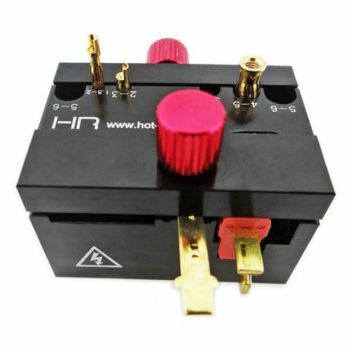 (1) Hot Racing RC connector soldering Clamp jig. 4) Then remove the soldering tip from the solder join, and let it cool done. Warning, The most dangerous is to connect positive and negative wires together creating a short circuit. 2) Only clamp on one pin at a time from the same battery. DO NOT solder both positive and negative connectors in the jig at the same time. Doing so will cause a short circuit and possibly a fire or explosion.